Iriomote Cats are small cats with a body length between 48 and 56 cms (18.9 - 22 inches), a tail length between 16 and 45 cms (6.3 - 17.7 inches) and they weigh between 3 and 7 kgs (6.6 - 15.4 lbs). They are greyish/brown in colour with dark markings. Iriomote Cats are endemic to the island of Iriomote, which is the most southern island in the Ryukyu Archipelago, Japan. The island is mountainous and has broadleaf, evergreen and sub tropical rainforests. Along the estuaries there are mangroves and the island has areas of cultivated land and beaches. Iriomote cats are found all over the island, usually close to a water source and they only avoid heavily populated areas. 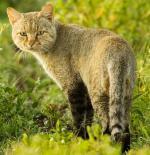 Iriomote Cats are solitary except during the breeding season. They have a home range between 1 and 3 sq kms, with those of males often overlapping but the ranges of females are less likely to do so. Iriomote Cats mainly feed on small mammals, birds, reptiles, amphibians, insects and occasionally fish. Iriomote Cats breed between February and March, and after a gestation period of approximately 60 days, they give birth to 1 - 2 young. The youngsters grow rapidly and they are weaned at 2 -3 months old. They are independent at 4 - 5 months old and they reach sexual maturity at 8 months to a year old. There are no documented predators of Iriomote Cats but they are under threat due to habitat loss and persecution from humans. 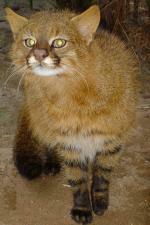 There are no subspecies of the Iriomote Cat. Iriomote Cats are one of only four cats that cannot retract their claws, the others being the cheetah, flat-headed cat and fishing cat. 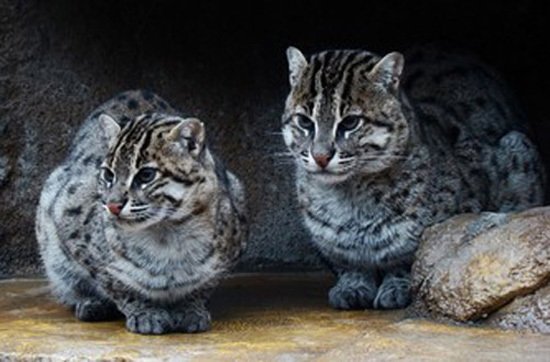 The Iriomote Cat was one considered a subspecies of the leopard cat, but now they are a species in their own right. It is believed that there are fewer than 100 Iriomote Cats in existance.